Occasionally errors are made regarding core selection. This especially includes baluns, where on occasion some very strange ideas surface. One rather odd but somewhat popular idea is that adding a mixture of core types will allow both high power operation and high choking impedance in baluns by slowly reducing current through a balun. Other misleading claims are that extreme values of core ui, such as values in the 10,000 or higher range, are necessary on 1.8 MHz and higher. Other ideas tend support use of excessively low permeability cores for the same application. When I recommend a core, the material selection is always based on actual measurements with proper test equipment on a bench as well as in the actual end-application. I mainly use 73 material for receiving applications in LOW POWER applications between .1 and 30 MHz. 73 and similar core materials generally minimize the turns count required without inducing excessive loss. One of the best indicators of correct core selection is looking at the turns required. You'll notice most of the transformers I use have only one or two turns for every 100 ohms of impedance. My 75 to 450 ohm Beverage transformers, for example, only require two-turn primary and 5-turn secondary windings. A low "turns count" is a good indicator the correct core size and core material is being used. Lower permeability cores generally are available with higher curie temperatures. They operate at high temperatures without losing their magnetic properties. Lower permeability cores have higher Q (lower loss tangent) at a given frequency. This means a larger part of the impedance is associated with lossless reactance rather dissipative resistance. They turn a smaller percentage of power into heat, and that is very important at high power levels. Permeability changes with frequency. As frequency is increased from zero eventually core impedance peaks. Above the frequency where impedance peaks the impedance of the core (and the effective permeability) actually decreases. A downward slope in permeability with increasing frequency is useful for controlling impedance in broadband transformers, but we should be careful to avoid excessive slope. Excessive initial permeability can easily move the operating area too far out on the downward slope of impedance. A transformer or inductor operating on the downward slope of a high ui core requires extra turns to maintain critical impedance and often requires more turns than a lower ui core. The upper frequency limit will decrease, and this may reduce useful bandwidth in the desired frequency range. Using excessive initial permeability means winding becomes more tedious (it takes more turns). The wire has to be smaller and more fragile to fit a given core window. Temperature stability is often reduced while losses increase over an optimum core material selection. In addition, stray capacitance increases needlessly, reducing bandwidth and increasing unwanted stray coupling. Do NOT pick cores solely by considering initial mu, since that value is taken at dc. You should consider characteristics measured at the operating frequency! Always remember this general guideline. Les wire length (as long as winding impedance is sufficient) results in better transformer bandwidth. The best designs place maximum conductor length INSIDE the magnetic core window, and minimum conductor length OUTSIDE the core window. At higher power levels, it is necessary to move to lower loss tangent and higher curie temperature materials like 65, 61, or (in extreme cases) 43 materials. Even a fraction of a dB loss produces significant heating in small cores when power level is in the kilowatt range. The loss DIFFERENCE in non-resonant applications between lower and high ui ferrite cores isn't significantly different, but heating can be much less! We often assume heat means a core is very lossy or is "saturating", but this often isn't true. We must consider the power level, duty cycle, and ability of the core to dissipate heat and look at the full picture. Very small cores, such as small thin .5 inch diameter cores used on bead-type choke baluns, can only dissipate a fraction of a watt in open air. It sometimes helps to put temperature in perspective by visualizing how hot a 60-watt light bulb runs in normal operation. When we consider the core's size, it usually has significantly less surface area than the bulb. The core also has poor thermal conductivity, and is often stuffed in a container preventing any type of air circulation. 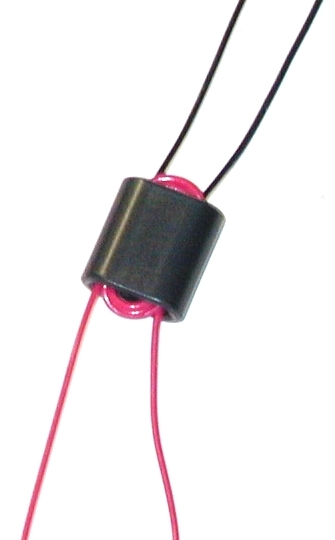 Consider the construction of a typical bead balun, enclosed in PVC and heat shrink tubing. As little as 20 watts dissipated out of 1500 watts can produce damaging heat in tiny beads enclosed in a PVC tube. 20 watts out of 1500 is less than 0.1dB loss, yet it overheats the core! The problem is almost always a heating problem, and not a core-loss problem. It is almost never core saturation, unless the core is subjected to very low average power and very high peak power levels. It is best that we worry about heat and the number of turns we use, not actual power loss, when selecting a core. Soft-iron cores (soft magnetically) increase inductance because they increase flux density near a conductor for a given current. With only a small amount of flux "concentration", there can not be a large increase in inductance or impedance. We need a significant increase in flux to have a significant increase in impedance. The area outside the core window does NOT have a closed magnetic path surrounding the conductor. The presence of the core has a minimal effect on impedance of any conductor area outside the core window. Most of the flux from external wires is in air, rather the core. With only a portion of the flux surrounding the outer conductors cutting the outer layers of the core, the useful impedance contribution of wire outside the core window to system impedance is minimal. Conductor length outside the core window mostly adds unwanted stray reactance and leakage flux. If we MINIMIZE the wire length exposed outside the core, and we generally have a more effective inductor, choke, or transformer. This effect can be easily conformed in a simple experiment using an antenna analyzer. Connect a short wire across the output of an analyzer, and measure the impedance. Lay a core against the wire, and observe the very small impedance increase. Now pass the same wire through the core center, and observe the large impedance change. This illustrates why the winding's wire length on the outside of the core is wasted, mostly contributing to undesired effects. The area inside the winding-window of a soft-iron (soft magnetically, not physically) core is cut by all of the flux lines, and this area has a very large effect on impedance. The core concentrates the magnetic flux surrounding a current-carrying conductor into a very small area, and the thickness of the core moving away from the area of the conductor very rapidly has less effect. The additional impedance caused by placing a core over a conductor or conductors is almost entirely proportional to the core's internal length (window depth) paralleling and surrounding the conductor or conductors. The core diameter or radial thickness only has a small effect on impedance. Doubling the core area parallel with a conductor roughly doubles winding impedance. The same is NOT true for an increase in core wall thickness, core thickness barely affects impedance. I prefer binocular cores for most low-power applications and side-by-side stacks of cores (making a large "binocular core") for high power broad-band applications. This type of core arrangement almost always minimizes the amount of conductor hanging "outside the window". With very little conductor hanging "outside" the core window, there is less "needless" wire adding undesired stray capacitance and series resistance. For a given core material and impedance, conductor length can often be reduced to about one-third of a similar impedance choke (or transformer) using a conventional single-hole core or single stack! Some of my receiving system designs use phase-inversion transformers. Phase-inversion transformers are identical to (and interchangeable with) choke baluns or line-isolation transformers. For HF receiving applications, 73-material binocular cores are wound with six passes of #26 twisted-pair enameled wire. I use Fair Rite Products 2873000202 cores (about 1/2 inch square and 1/3 inch thick 73 material). This shows inverting transformer construction is good, since even a 10-ohm impedance load works well! Sometimes I use designs for a long time, and forget how I decided they were OK. I recently received an e-mail questioning the number of turns in my Beverage transformer design, so it seemed like a good time to re-confirm the design. I retested a 2:5 turn ratio transformer using a single FairRite Products 2873000202 core (about 1/2 inch square and 1/3 inch thick 73 material) two different ways on a generator/ network analyzer/vector impedance test set. Total loss of two back-to-back transformers was .84dB at 1 MHz increasing, not decreasing, linearly to .98dB at 30MHz. The actual transformer loss would be .42dB at 1MHz increasing to .49dB at 30MHz. Doubling turns increased the attenuation slope. While 1MHz loss decreased to .69dB per pair, 30MHz loss increased to 1.21dB. This was for a PAIR of transformers connected in series to make a 1:1 transformer. This of course removes mismatch losses, so it is twice the real transformer loss. Actual loss would be .35dB @1MHz increasing to .61dB at 30MHz. Measuring a second way, I terminated the transformer in 470 ohms. Loss measured .65dB at 1MHz when mismatch loss was included. Since receivers have wide ranges of input impedance, any mismatch error might help OR hurt actual system loss. Factoring out mismatch loss the second measurement indicated about .53dB 1MHz loss with the original 2-to-5 turn transformer and .43dB with twice the turns. Every measurement has tolerances, and the two different methods do provide different losses because measurement errors affect results differently. Still, it is safe to say doubling turns has a negligible effect on 1MHz loss (which is around .45dB).